We DID IT! The 1st Annual SLO Jazz Festival - 2014 Mercedes-Benz SLO Jazz Festival, Presented by Alfano Motorcars - May 17, 2014! Scroll through this whole page for our thank you messages! 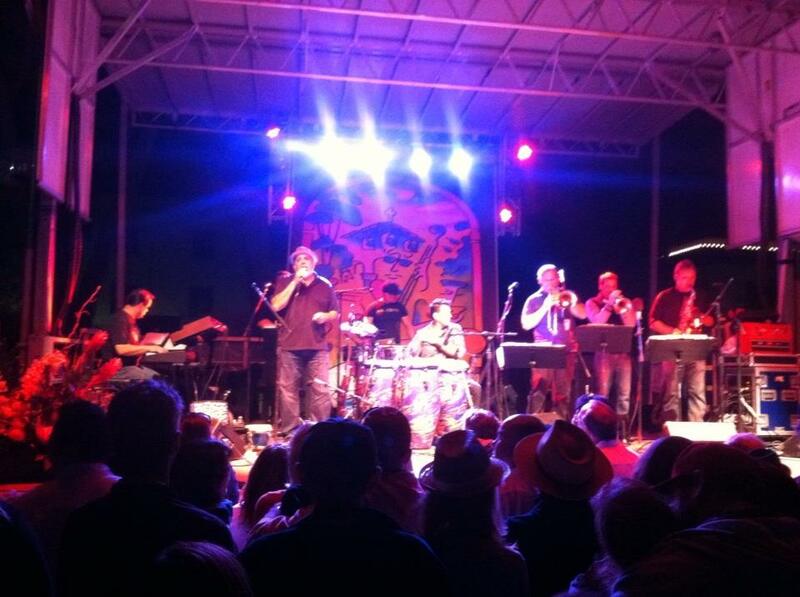 NOTE: If you attended the SLO JAZZ FESTIVAL, please complete the EVENT SURVEY. 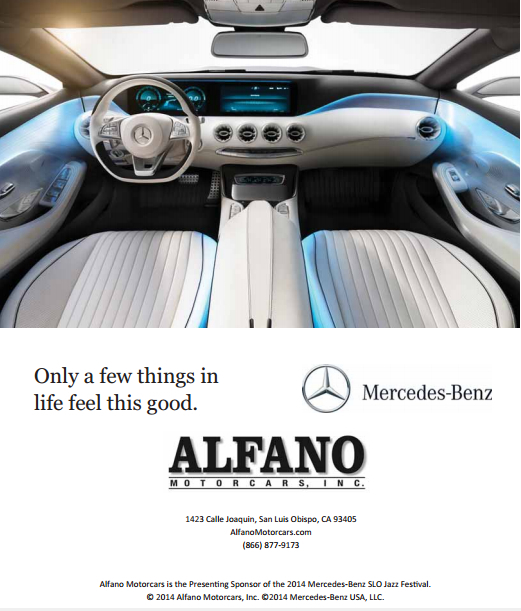 Click here to view photos and videos of the 2014 Mercedes-Benz SLO Jazz Festival, presented by Alfano Motorcars. 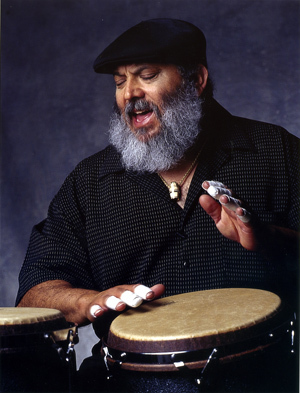 Below: Enjoy a video of Poncho Sanchez at the 1st ever SLO Jazz Festival, plus THANK YOU messages to our supporters! Photo: Poncho Sanchez and His Latin Jazz Band, live at the 2014 Mercedes-Benz SLO Jazz Festival presented by Alfano Motorcars on May 17, 2014. 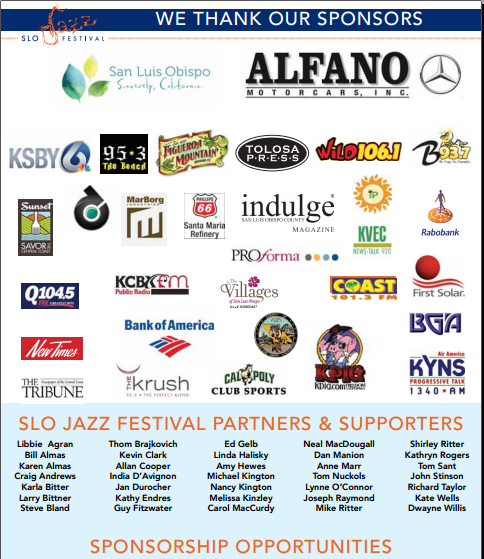 We thank our key venue partners, sponsors, and supporters for the Alfano Motorcars Presents: 2014 Mercedes-Benz SLO Jazz Festival. With your support, this event was a TREMENDOUS SUCCESS! 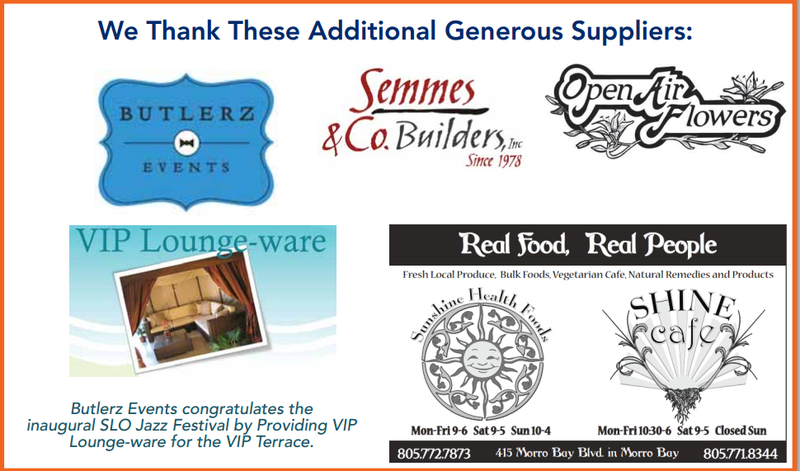 Thank you to everyone who attended, volunteered, supported, donated to, sponsored, and performed at the 1st ever 2014 Mercedes-Benz SLO Jazz Festival, Presented by Alfano Motorcars! Feedback from around the community has been "awesome" and "outstanding" -- we're gathering ideas to improve the jazz festival, and encourage you to join our email list! Please click here to see all of the wineries who contributed wine to our winery program and raffle - we thank each of you - who were simply incredibly generous! We also thank Figueroa Mountain Brewery for your hard work and contribution of wonderfully delicious ales. We thank our food vendors Alexandra Steinecke, Seaside Cafe, Gypsy Bar-B-Que, and Kettlecorn To Go, as well as vendors: American Laser Skincare, Diamond Resorts, REC Solar, Cal Poly, Information Press, and The Villages of San Luis Obispo - you all made this an incredible day! To everyone who attended, thank you!!! We thank KSBY, Tolosa Press, Radio Central Coast, New Times, American General Media, Savor the Central Coast/Visit San Luis Obispo County, The Tribune, Phillips 66, Bank of America, First Solar, Cal Poly Athletics, El Dorado Communications, KCBX, American Marborg, Information Press, County Board of Supervisors Adam Hill and Debbie Arnold, Mayor Jan Marx, Molly Cano, Tourism Manager and Lee Johnson for San Luis Obispo, Ryan Allshouse and Rosetta, the Tourism Board (restaurateurs and hoteliers of San Luis Obispo), and Rabobank. We thank the San Luis Obispo Chamber, SLO IFF, SLO Symphony, Mozaic Festival, SLO Blues Society, Shell Cafe, Barnett Cox, Cuesta College, Semmes Solar, Bliss Cafe, Guayaki, Seaside Cafe, Gypsy Bar-B-Que (Creekside Brewing), Open Air Flowers, Five Cities Eco-Rotary, American Marborg, Taylor Rental, Butlerz, Central Coast Public Safety, Therese Cron and the San Luis Obispo Collection, Steve Bridge, Heritage Oaks Bank, AdSmart, our families, members, people who wrote checks, and the many, many volunteers and organizations who supported our efforts to produce the first ever SLO Jazz Festival! Heiko Schwarz, Everette Brooks, Matt Beasley, Doug Federman, Craig Updegrove and the SLO Jazz Federation, Lois Mahaila, Thomas Sant, Steven Lynes, Sr., Shannon Coleman McGee, PJ Novotny, Gary Pritchett, and Frederick Clegg. Your contributions helped us create the Locals in Jazz Stage. We thank John Landon and Landon Gallery - your artwork was stunningly superb! We thank Pacha Hornady, from Purely Pacha, for your forever wonderful logo design! We thank Tony Holt for his excellent graphic design on our programs, handbills, t-shirts, and posters. Thank you to Proforma In Motion, who helped run our Merchandise Booth and create all of the banners and swag. We thank our entire core operations team and staff, Scott Andrews, Kevin Costigliolo, Joseph Tyra, Mary Kay Harrington, Mark Pietri, Laura Jeffrey, James Davis, Jason Hoar, Alexandra Steinicke, and so many new contributors, Cecile DeMartini, Dave Jeffrey, Janae Brolin, Deanna Dinco, Jenna Campigli, Maydell Costigliolo, Frank and Kathy Andrews, Thomas, Dan Manion, and all of the volunteers too numerous to mention! Also, thanks to an great sound performance by Bill Gaines Audio and his team. A special thank you to Lance Kinney, Photography (photos here). We wish to especially thank our Presenting Sponsor and Title Sponsors for the 1st ever jazz festival, titled "Alfano Motorcars Presents: the 2014 Mercedes-Benz SLO Jazz Festival" which was presented by Alfano Motorcars, with Title Sponsors Mercedes-Benz and the City of San Luis Obispo (PCC) and (Tourism). Without you, this would not have been possible - simply - thank you! Coming July 7 - 10, 2014, is the first ever SUMMER JAZZ CAMP! 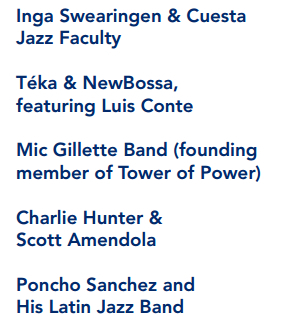 This education opportunity for youth and adults ages 13+ is a joint production of SLO Jazz Festival's Executive Staff and Cuesta College Community Programs.